Sovenir toy soldiers; early remembrances. Stay with your bus buddy. 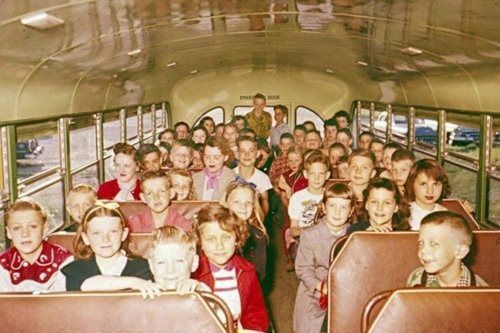 Just about every kid...just about every when I was a kid, that is...went on the yearly school fieldtrip with a grubby pocketful of dimes and quarters with which to by sovenirs at the various historic sites that the yellow school bus took him or her to - except, of course, for that time when our annual fieldtrip was a tour of the Buick plant in Flint (what a bust that was). Those junky keepsakes were usually quickly lost through a hole in the pocket, sucked up by the vacuum, or wedged deep into the frame of the sofa. But whatever their fate, often the memory remained, and a lifetime learner was born. This is the first of four posts focusing on Americana soldier "figurines" (as they are listed in the Americana catalogue). My small collection consists of American Civil War yankees and rebels and Revolutionary War Americans and British soldiers. This installment concerns itself with some of the Americana ACW Union soldiers. This Union infantryman in kepi and frock coat is typical of these made-in-China Americana figures - whimsical, taking liberties with accuracy, somewhat (is simply) detailed, and gloriously shiny. The loosey-goosey version of accuracy reminds us that the purpose of toy soldiers is play, fun, and imagination...this is even the criteria by which I measure my high-end W. Britain's toy soldiers. This Union flag-bearer has a lot of charm, even though his flagstaff is a little wilted. An infantryman would have light blue chevrons instead of these cavalry yellow ones, but considering that the artist is an underpaid laborer in Red China, "close enough is good" enough , I always say! Much more accurate is this jolly and jaunty cavalry trooper. The carbine slung from the shoulder is a very nice touch, isn't it? The Union general is my favorite. Sword in the forefront and binoculars at the ready. The glossiness of this general, like all the Americana figures, is one of the aspects that make these some of my favorite toy soldiers. Although he has no chevrons, this yankee rifleman has the sash and trouser stripe of an NCO. The funny thing is that he is looking straight ahead while his rifle is pointing off to the side...perhaps he's been distracted by the man beside him having his little hat shot off. Utterly charming is this Union drummer boy, sadly he has some scratched paint...battle-scars, no doubt. Despite this, he drums on in the finest tradition of the steadfast tin soldier. The packaging of these little guys is very nice, each in a thematic window box. Wha, wha, what? !...Did I miss something? What a whacky declaration. Who else would they be for? Ferengi? Each box has a little historical interpretation blurb...a nice touch for sparking a kid's interest. Like just about every other toy soldier company, cheap labor drives the price-point. I really like these little 54mm charmers. What a great field trip! I hear from my brother that in fifth grade we'll be going to the Coke bottling plant! I'll save you a seat on the bus. Another one of those beautiful red and gold boxes that make a boy's or girl's heart beat faster arrived in the mail recently and it was with great anticipation that I opened it up and started unpacking the custom-cut foam and tissue that is a hallmark of W. Britain products...and also one of the things that makes them so expensive - you are definitely paying a premium pricefor the packaging, nonetheless, the careful packing insures that your soldiers always arrive in perfect condition and ready to play with. This box contains set #31097, Union artillery. As I've previously mentioned, I'm assembling resources to recreate the action of Battery B, 2nd US artillery at the Battle of Antietam. 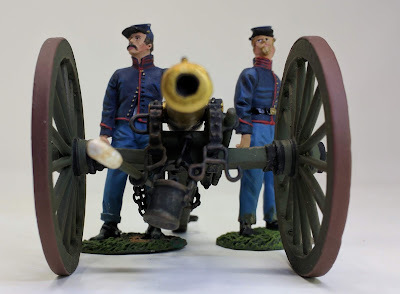 I've converted many infantry figures into artillery, I'm painting lots of plastic artillerymen, and I'm scouring ebay for cannoneers. I'll end up with the men, horses, limbers, and a few of the caissons I need to support a six-gun battery of twelve-pounder light-gun howitzers just like those employed by Battery B on September 17, 1862 - "America's bloodiest day." The gun detachment for a twelve-pounder generally was comprised of eight men, each with a specific role in the loading and firing and all cross-trained in every position. Civil War artillerymen took enormous pride in their piece and constantly drilled to achieve a high degree of proficiency. This is a really nice set that portrays the loading of the piece. Here the #1 man is ramming home a projectile with the rammer end of the sponge-rammer. This was a one-handed operation...if the charge went off while ramming, it was much better to lose one arm rather than two. There are historical accounts of this happening. The projectiles for the twelve-pounder were "fixed" ammunition with the powder charge, in a wool bag, attached to a wooden sabot which was affixed to the projectile with tin straps. Wearing a leather "thumb-stall" he keeps his thumb pressed on the vent during the loading process. When a shot is fired smoldering particles of the wool powder bag remain behind in the barrel. The sponge end of the sponge rammer is dipped in the water bucket and the #1 man drives the wet sponge down the length of the barrel to extinguish any sparks or embers. As the sponge is a tight fit, it acts much like a piston driving the air before it down the barrel tube and out the vent...a place that the sponge cannot reach. By blocking the airflow with the thumb, sparks and embers are prevented from lodging in the vent. When the next round is driven home the #4 man drives a long pointed brass rod called the "vent prick" down the vent to pierce a hole in the powder bag, exposing it to the jet of flame from the friction primer; were there to be any remaining sparks or embers trapped in the vent, the act of driving the vent prick down the vent and into the bag would also drive those sparks into the bag, detonating the charge prematurely and perhaps fatally. The thumbstall is essential for preventing this. Nicely detailed (though poorly-lit) is the thumbstall being worn by #3. The thumbstall was made of heavy leather with horsehair padding on the ball of the thumb. After continuous action these often burned completely through. The only flaws in this set are that both the sponge rammer andthe water bucket are stowed rather than deployed, which would have been essential in the scenario depicted. This is the bucket that #1 dips the sponge in to moisten it. The roles of the other two crewmen are ambiguous either may be the #4 or #5 man, but their posture doesn't make clear what their individual roles are. The sculping is wonderful, as is the animation, a hallmark of W. Britain. The word "haughty" comes to mind. Three of the four figures are wonderful, but the fourth leaves me scratching my head. His posture provides no idea of what he is doing, and he looks quite off balance. Unusual for a Britian's figure is the poor detailing of the eyes, leaving this guy to look like crazy-eyes Magee, the guy you never want to find yourself sharing a cell with. The #1man is perfect in all respects. It's a great set, and I'm very happy with it. This is my third purchase from Crown Military Miniatures, they're very nice people to deal with, have free shipping (over $50.00) and have very good customer service. As I start to collect Iron Brigade figures, I'll certainly be patronizing Crown. As I continue to make preparations, I expect to see another fun TSF! dramatization in late autumn (like a mini Second Battle of Greenbrier, but this time it'll be non-fiction). I think this post should actually be - "Hey! look who got his first Social Security check!" On ebay last month I found a used W. Britain's #17379 in perfect condition. This set was manufactured from 2001 to 2004, and I consider myself very fortunate to have gotten it for such a bargain price. There's no narrative this time...the pictures speak for themselves. Whew!...I've gotta go lie down.